In another case, a patient had continuing pain after having a scaphoid fracture treated with a Herbert screw. A CBCT scan was able to show that the screw was not well incorporated into the distal pole of the scaphoid. Traditional radiographs were only able to show that it was well incorporated in the proximal pole of the bone. The metal scattering artefact from the screw may have hindered mal-union diagnostic. CBCT helped patients receive better care in both of these cases. Limiting the radiation dose to the patients must also be everyone’s objective. The radiation delivered by our CBCT scanner is 65-92% less than a conventional CT (Smith et al). 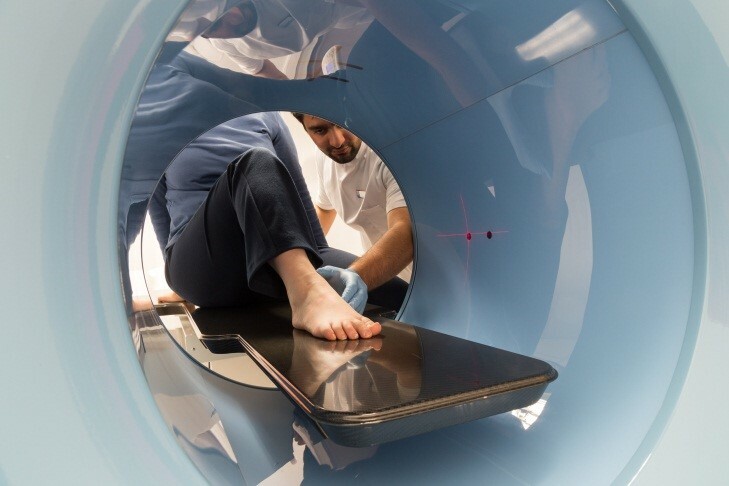 The radiation received by the patient from an ankle CBCT using our standard protocol is 10 times less than that of a conventional CT scanner and equivalent to that of 2 x-rays (Koivisto et al) but, with obviously, the whole 3D information. The scanned bones can be analysed in a multi-planar fashion or as volumes. The latter become therefore virtual anatomical models which have tremendous value in their own right. 3D Prints of these models provide a tangible means to evaluate and plan surgery. They are made from CBCT scans but also from conventional CT scans which the surgical teams, both private and NHS, sent us electronically. Visit our 3D prints page to learn more about them: fantastic tools to increase surgical accuracy, predictability, safety, time-saving and tangible 3D understanding. There are many other injuries and diseases of the musculoskeletal system that are a referral criteria for an Orthopaedic Scan. We are keen to consult with your radiologists, as well as with ours.